Good Guy Bad Guy is a documentation of a young man’s negotiation with the teeming metropolis of modern day Bengaluru. 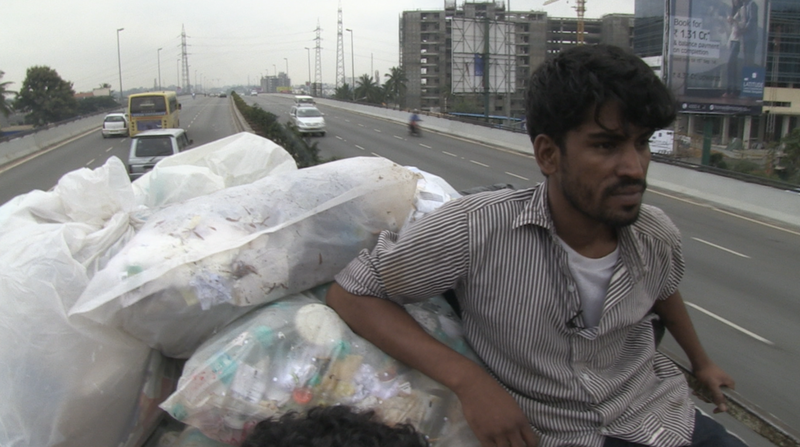 Rendered with extraordinary humanity and integrity, the film’s strong, vivid energy layers the story of the untameable yet somehow sweet and fragile Zakhir, a run away who makes his living as a rag picker. The film opens directly with a search for the missing Zakhir. Zakhir has caught the imagination of Indu Krishnan, a film-maker scouring the city in quest of a film. She is determined that she will use frequent visits to her family home and city to create a cinematic document. Walking in Cubbon Park, a green space that retains a flavour of the place she grew up in, Indu encounters Zakhir feeding the feral monkeys of the park with a touching tenderness. It is not right to cage animals, he says at one point. When the young man disappears, she searches for him. The search is driven not just by concern, but also by a self-stated desire to finish the film. This honesty of approach is evident throughout the document, both in the visual and in the narrative, lifting it from Herzogian voyeurism to a vibrant engagement with humanity. In the course of their many conversations, Indu discovers that Zakhir wants to make his own blockbuster about a demon-slaying foster mother of orphans. The camera follows Indu and Zakhir through the mad colour and bizarre social schisms of the city as they participate in each other’s film-making dreams. Ultimately, the film explores the wild underground life of the city and the nature of the run away through the gentle, expressive, and ever-hopeful spirit of Zakhir. Indu Krishnan grew up in India. She earned a Bachelors degree in psychology from Delhi University. She subsequently took courses in fine art at Parsons School of Design and got a Masters in Media Studies at the New School for Social Research in New York. She has worked for corporate and public television in the US and in between independently produced her own documentaries. She currently divides her time between Bengaluru and San Francisco. 2017: Director/Producer. Good Guy Bad Guy reveals with humanity the street life and celluloid fantasy, family and violence, tenderness and inconstancy that enmeshes a young recycler in Bengaluru. 2004: Director of the India story for ‘The New Americans’ the acclaimed mini-series by Kartemquin Films. Following an H1-B programmer from Bengaluru to Silicon Valley through the boom and the bust the story rips aside the curtain on the American Dream as experienced by many Indian Americans. 1990: Producer/ Director ‘Knowing her Place’ – A moving investigation of the cultural schizophrenia experienced by an Indian woman who grew up in the U.S. uncovers conflicted relationships with her mother and grandmother in India and her husband and teenage sons in New York. Fusing photographs, vérité sequences and experimental techniques the film probes the multilayered experience of immigrant women with rare candor and emotional resonance. Broadcast in US on Independent Focus, WNET; The Learning Channel; Worldwide: Doordarshan, India, Canada, Australia and Swedish TV. Festivals: Margaret Mead, Hawaii Int’l, The San Francisco Int’l film Festival. Distributed by Women Make Movies.